How Are You Currently Ensuring Product Quality – Proper Moisture Control Yields Higher Profits! Does the measurement of Moisture play a role in the proper production of your product? MoistTech Corp. manufactures a range of sensors and gauges to measure Moisture content, Oil content and Fat content as well as the Thickness / Coat Weight of Coatings, Hot Melts, Glues, Adhesives, Printing and more. Accuracy and reliability are our main focus points for you as a customer and we come with over 40 years of industry knowledge and experience at your disposal. MoistTech has installations in almost every type of application including harsh applications and environments where other gauges could easily break down. The MoistTech sensor currently operates in thousands of applications worldwide and we are confident our technology will help you provide a better-quality product, increased production and add money to your bottom line. You can browse some popular applications below OR contact us to discuss your specific application in more detail. Manufacturing companies are constantly adjusting moisture to maintain the quality of their product. Small variations and excess moisture in some mixes can result clumping affecting quality and consistencies. Too dry of a product can result in excess dust. Measuring moisture prior to crushing a product can control particle size and also provide dust suppression. During the drying stage, in-process measurements ensure optimization and elimination of over drying, which can lead to product that is out of specification, degradation and an excess of dust. Accuracy and Reliability: What’s worse than a wasted effort? Economical losses and decreased productivity. The accuracy and reliability of MoistTech’s line of sensors sets them apart from the competition with their state-of-the-art Near-Infrared technology. Insensitive to material variations such as particle size, material height & color, the 3000 series sensors provide continuous, reliable readings. Production efficiency improvements due to accurate real-time measurements provide both energy savings and potential increased productivity with lower material losses. Our sensors use state-of-the-art components al lowing installation in the most extreme locations. As a result of MoistTech’s advanced digital processing, only the 3000 series provides true data regardless of gaps and interruptions of product flow on the belt or screw conveyors. 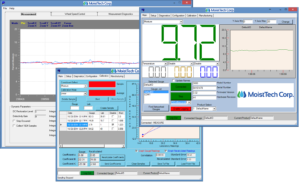 In addition to the MoistTech management software, we offer several read-out options to display and / or adjust the measurement outputs. Start seeing the ROI in the FIRST 30 DAYS of use! With reduced waste, increased productivity, less down time and improved product lines, the utilization of a MoistTech system is essential to proper quality control. We are confident our system is the best fit for your application and better yet, we offer a 30 day satisfaction guarantee to ensure success with our customers. Consider what you spend – or lose – on wasted product, lack of efficiency, consistency of product, environmental costs and quality control. The MoistTech Corp. system solves many of the common problems found on the manufacturing line. Here you can view multiple videos with in field feed of the moisture and thickness sensors in action.